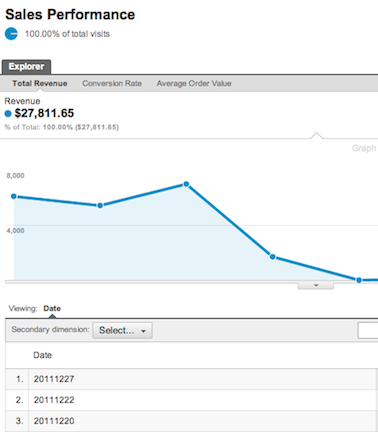 Analyzing and Interpreting ECommerce Reports. Modify your profile level settings to enable Ecommerce reporting. Add GATC to your receipt pages. 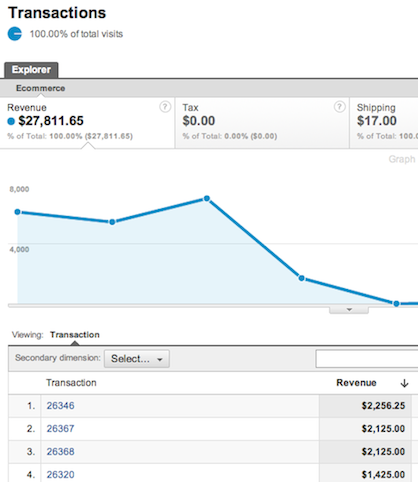 Add Google Analytics Ecommerce tracking code to track each transaction. Note: You have to enable Ecommerce settings for every single profile under which you want to track Ecommerce transactions. Ensure that you have included GATC tracking code on your receipt pages. The GATC tracking code can be found in your profile settings as shown in the following screenshot. For Ecommerce implementations, place GATC near the top of the page instead of the bottom of the page. This method collects the primary order information and takes the following arguments: Order ID, Affiliation, Total, Tax, Shipping, City, State, Country. The order ID parameter from this method is used to link a transaction with the _addItem() method. This method collects all the product related information such as the name of the product, it's SKU, quantity, etc. For each item that the visitor purchases, you will have to call the _addItem() method and pass different parameters as listed above. For example: If someone purchased two computers of the same make and model, then you will call the _addItem method just once. 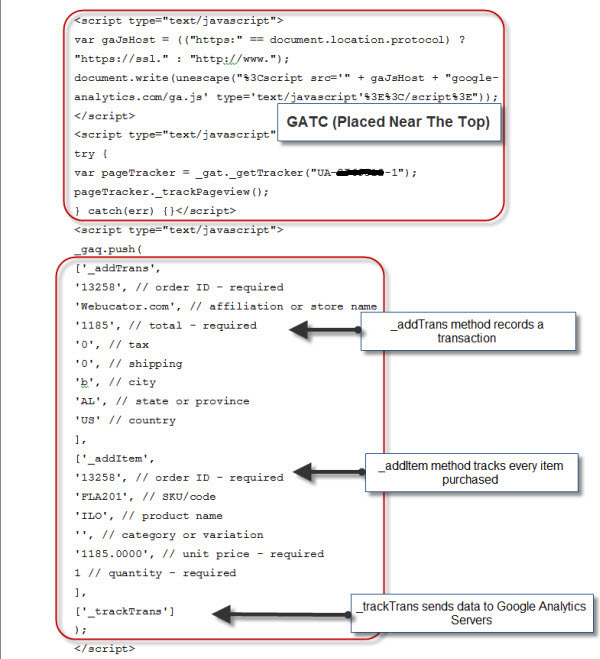 This method will be called at the very end of the process and it is used to send data to the Google Analytics server. 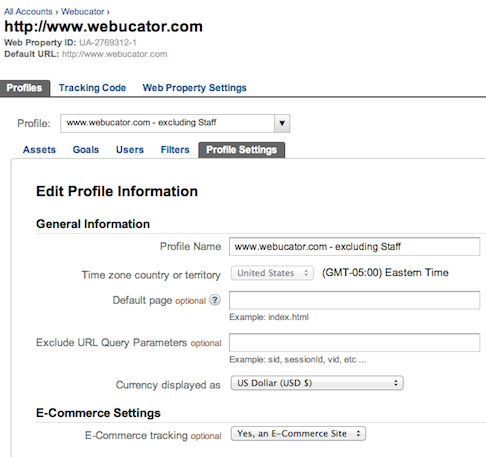 Ecommerce data is sent separately from the visitor data using this _trackTrans method. Note: The values shown in the above example are what you will see if you view the source code on the receipt page after the transaction is completed. However, your website code will need to dynamically retrieve the values from your Ecommerce platform to populate these fields. This report provides an overview of Ecommerce activity on your site. 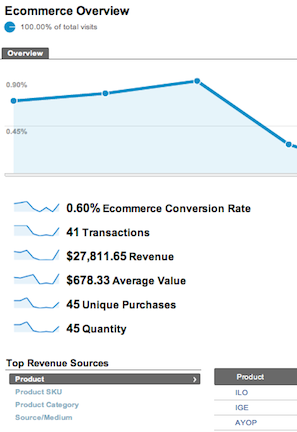 It shows a snap-shot of the Ecommerce Conversion Rate, Sales and Top Revenue Sources. 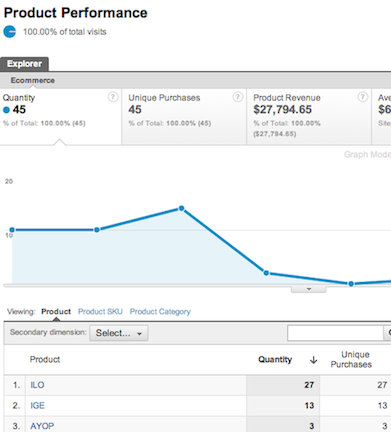 All of the Ecommerce reports are now available under the Conversions Reports of the reporting interface. This report shows your performance listed per product (designated in your Ecommerce tracking code). By default, you can see the Quantity,	Unique Purchases,Product Revenuue, Average Price, and Average QTY for all of your product categories, or you can click on any product to see specifics. Use this report to determine which of your products are performing best (or worst). This report shows your total day-by-day revenue listed in order of which days produced the most revenue..
Use this report to determine spending patterns of your customer base, i.e. which day of the week the most revenue was generated. This report shows your Ecommerce transactions, broken down by specific transaction numbers. Use this report to determine which transactions have resulted in the most revenue for your company. 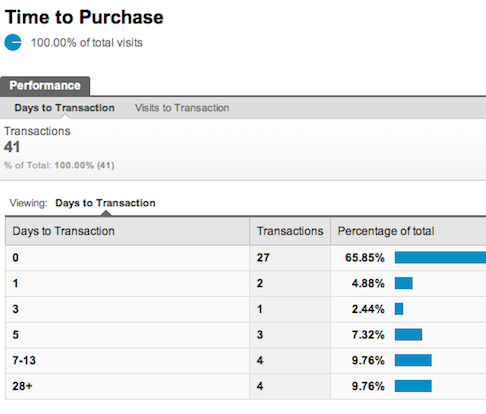 This report shows how many days visitors returned to your website before they made their final purchase decesion. This report is broken down by number of transactions. Use this report to determine your sales cycle and website engagement, i.e. 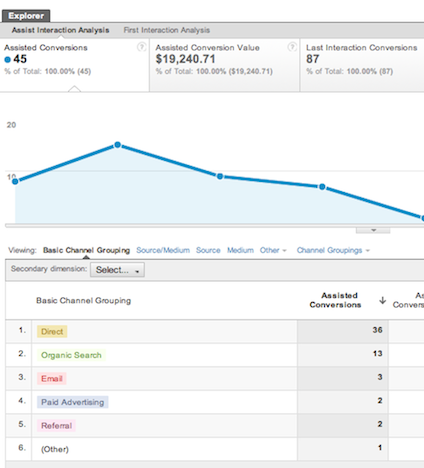 how many times does it take your target audience to come back to your website before they choose you as their product/service provider..
Use the Overview report to determine how many of your total conversions (goals + transactions) over your selected time period had "assisted conversions". In the screenshot below, you can see that this website had 87 total conversions in the time period, and 45 of them were assited by multiple traffic sources. 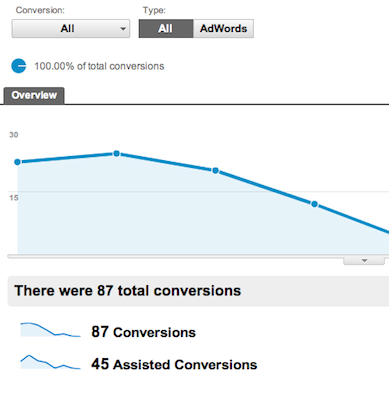 This report shows you more detail about your assisted conversions. By default, you will see your main channel groupings listed in the report. Note that you can also switch over to source or medium view as well. Use this report to determine which sources helped along the conversion path. This will also help you determine which online marketing avenues to focus your time and energy on. 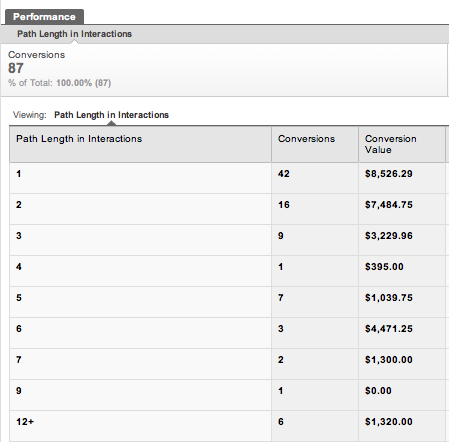 This report shows you the most popular traffic paths visitors took to complete a conversion. 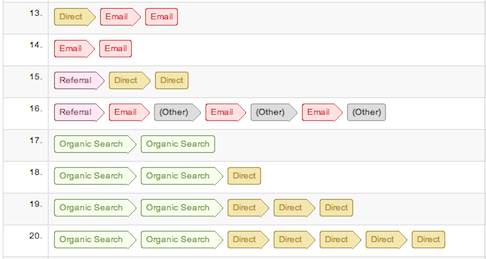 This report will also show you paths that include the same traffic source. For example, you'll be able to see when people may come to your site directly six times before completing a conversion. Use this report to determine your most popular paths, and see if you can conclude any online marketing changes/improvements to gain shorter paths. In the above screenshot, look at line #13. This website visitor came to us directly at first, and then clicked on one of our emails twice to return, and then complete a conversion. 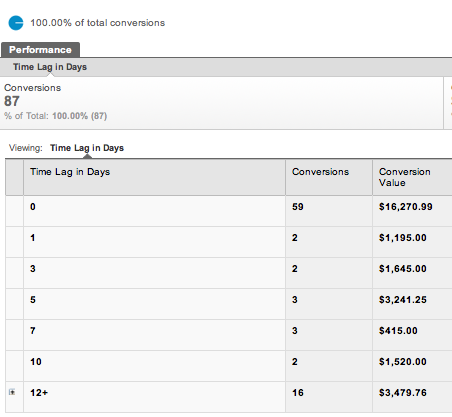 This report shows the number of days in between visits before a multi-channel conversion has been completed. Use this report to determine the overall length of your online sales cycle. This report shows you how many conversions happened based on the overall length of the conversion(s), more specifically, the number of channels that were involved in each conversion. Use this report to determine your online engagement, and how many channels need to be involved on your website before a conversion is recorded.